you know fall is just around the corner when beautiful winter squash starts popping up at the farmers market. truthfully, i look forward to the transition into each new season. winter to spring, spring to summer & summer to fall all have something special to offer us and bring with them a renewing energy. fall is definitely my favorite season - warm sweaters, skinny jeans with boots, apples, pumpkins & winter squash are just some of my favorite things about fall - really i could go on and on....cool crisp fresh air, fall foliage, halloween & thanksgiving. okay, i am sure you get it - i ADORE fall! i went to the saturday market on a mission to find the first acorn squash of the season. only to find that acorns are not quite ready yet, instead i found these little beauties - sweet dumpling squash. 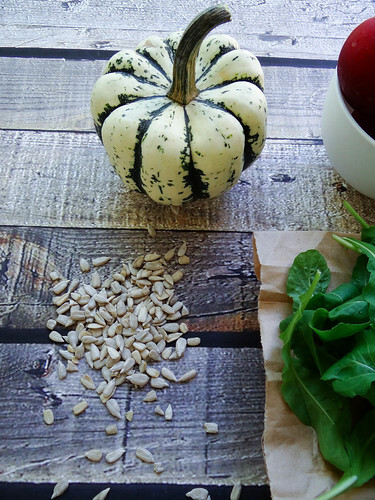 the sweet dumpling squash is a relative of the delicata - one of my favorite winter squashes. let me tell you, the sweet dumpling squash will give your favorite squash a run for its money. the flavor is amazing - sweet and velvety in texture. 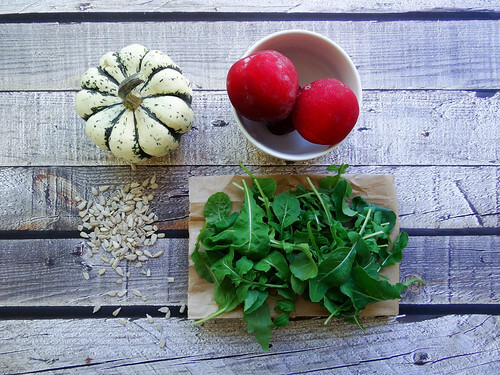 fall also brings with her the perfect growing weather for arugula, spinach & lettuce. 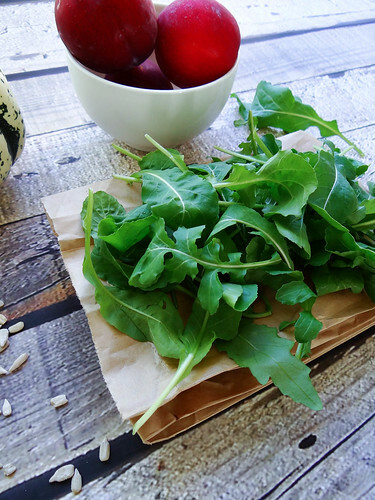 my favorite being arugula - which i harvested into november last year and hope to do so again this year. 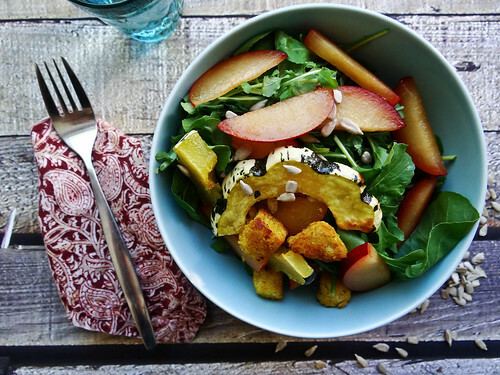 this simple salad is tossed with the last of the seasons nectarines, sunflowers and topped with the roasted sweet dumpling squash - then dressed with a maple dijon vinaigrette. 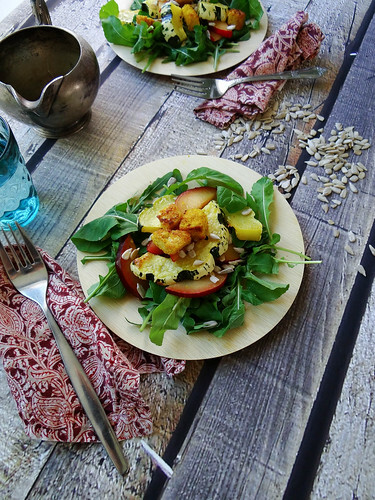 i personally enjoyed this salad with a cup of curry corn chowder (recipe to follow!) then the following day for lunch. the squash is excellent warm or at room temp. another great thing about the sweet dumpling squash is the skin is edible and pretty beautiful too! pre heat oven to 350* - prep squash by cutting in half and remove the seeds. cut each squash half in half, then slice into half moons. 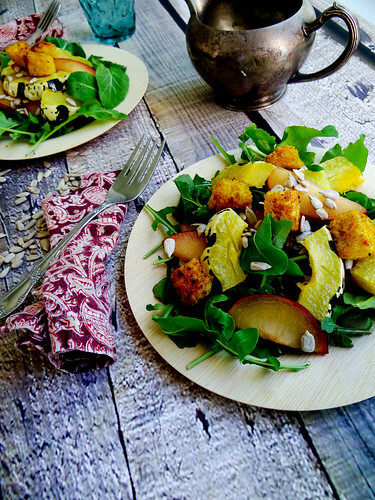 drizzle olive oil over the squash & toss with salt - roast in the oven for 20-25 minutes. 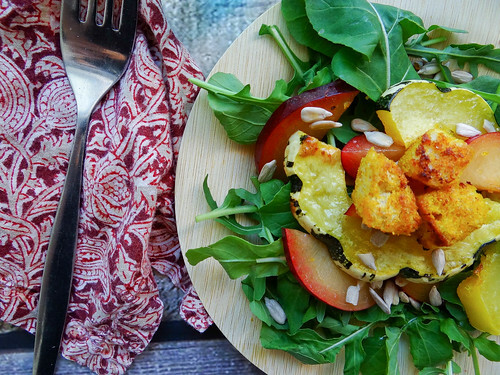 prepare the croutons while the squash is roasting. cube the bread into 1/2" cubes - in a medium saute pan, melt better and olive oil over medium/high heat. place bread cubes in pan and sprinkle with curry, salt & nutritional yeast. toss bread cubes until all pieces are well coated with butter/olive oil & seasonings. cook on the stove top until golden brown on each side - set aside. make the dressing by combining all ingredients in a jar with a cover and shake well to emulsify. 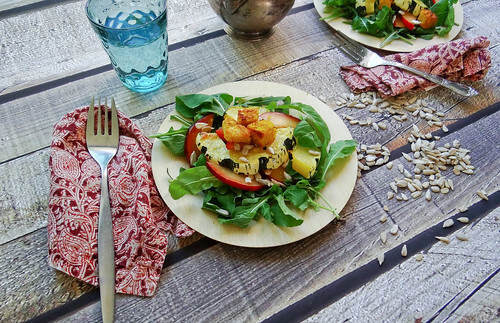 assemble salads by placing the greens on the plate, top with roasted squash, nectarines & sunflower seeds. 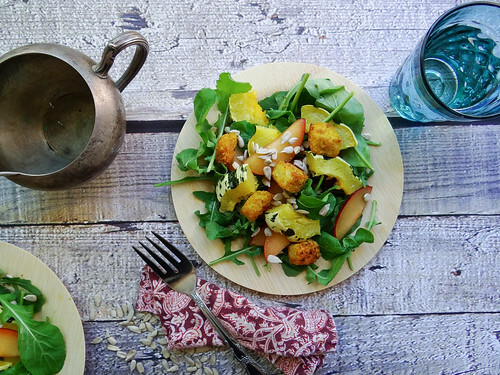 drizzle the dressing over the salad & top with croutons. I've never had this type of squash before- but I'm definitely going to keep my eyes peeled for it when I go to the market tomorrow! well..i need to get my hands on a dumpling squash asap! just the thought of not having to peel that bugger is as much convincing i need! i love that you added nectarines. it's a summer/fall fusion. and it looks beautiful. Yes you do! Not having to peel it is definitely alomst reason enough to get one...that and they taste amazing! LOVE Butternut too - but I definitely have a special place in my heart for little squashes, especially stuffed! oh my gosh what a gorgeous salad! it sound super delish! i just LOVE fall too!! crisp air, sweaters perfect! Loved the croutons too - they were so good on the curry corn chowder, I am hoping to make another batch this weekend! Thanks Uru - it was pretty delicious! I love squashes with edible skins! such a great addition to salads. What a gorgeous collection of flavors! 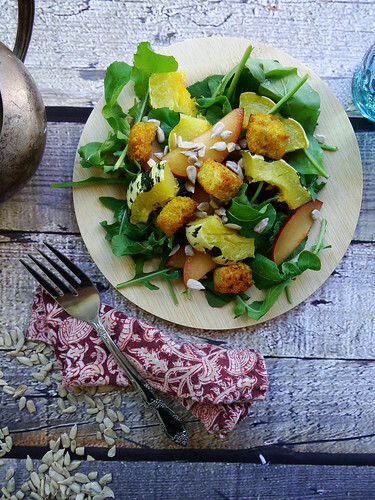 Winter squash and nectarines are great alone, but how amazing is the addition of curried croutons?!?! That sounds fantastic! Fall can't come any sooner! I discovered delicata squash last year and it became one of my favourites - I loved its small size and the fact that you could eat the skin. So I'll definitely have to keep my eye out for sweet dumpling squash this year! 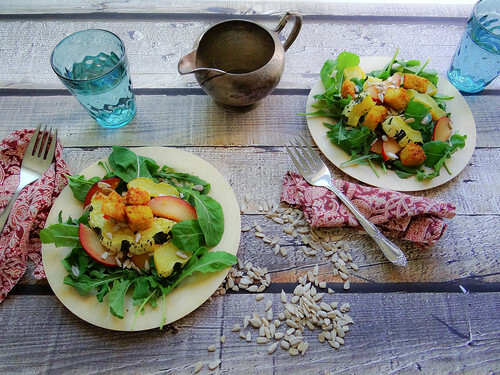 I'm always looking for new ways to use squash, and this salad is so creative! 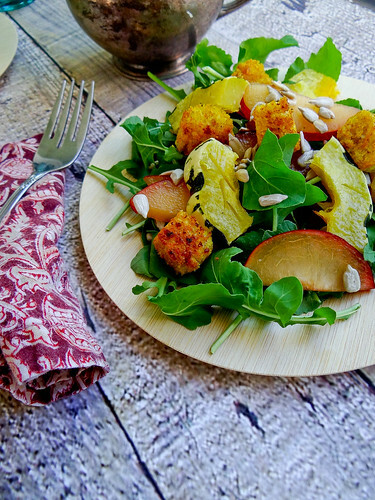 I love the idea of pairing it with stone fruit, and those curry croutons sound scrumptious! LOVE delicata, so amazing - this is simialiar but seemed to be a little sweeter - I hope you get a chance to try it, I just know you will love it!